Ursula Kern, proprietor of the Kern Secretarial Agency, refuses to accept the official conclusion that the death of her employee and friend Anne Clifton was due to either suicide or natural causes. A note clutched in the dead woman’s hand leads Ursula to believe that her friend was murdered. Since the police won’t investigate, Ursula decides to conduct her own investigation, and the logical place to begin, since Anne, like her employer, was an unmarried woman with no family, is with Anne’s last clients, Lord and Lady Fulbrooke. But first, Ursula must inform her own client, legendary archaeologist Slater Roxton, that another client’s work takes priority over cataloging antiquities for him. Slater is not pleased with the news. The illegitimate son of actress Lily Lafontaine and wealthy aristocrat Edward Roxton, Slater is a legendary figure who miraculously survived being trapped in an ancient burial chamber and thus became a media sensation. Abandoned by his companions who thought he had been crushed to death beneath the falling stones, he lived for a year on Fever Island, thought to be uninhabited. The island was actually inhabited by a monastery belonging to the Order of the Three Paths, a philosophical rather than a religious order, whose ideas and meditative practices transformed Slater. Despite the fact that his father recognized him, provided him with a gentleman’s education, and even made Slater sole trustee of the Roxton fortune, Slater has never been at home in society. He senses in the heavily veiled Ursula a kindred spirit. Unhappy with Ursula’s decision to play detective and concerned about her safety, he insists on joining her investigation. Ursula has mixed feelings about Slater’s role as co-investigator. She is aware that his background gives him access to his mother’s theatrical connections and to his father’s upper-crust world, access Ursula lacks. Also, she knows his experience recovering lost and stolen treasures could prove useful. But she is jealous of her independence and fears that he will not see her as an equal. Theirs is at times an uneasy alliance, but each brings something unique to the partnership. Although superficially different from one another, Ursula and Slater are alike in fundamental ways. They are both proven survivors remade by experience. Ursula recreated herself when a disastrous marriage, a poverty-stricken widowhood, and an epic scandal made her former life impossible. Although Slater did not change his name and he does have some close family ties, he is a very different man from the young archaeologist who chased a myth. As each observes independently of the other, Ursula’s veil and Slater’s glasses serve the same purpose—to limit the view others have of them and to keep the larger world at a distance. It is Slater who discovers that Lord Fulbrooke is connected to the Olympus Club, a mysterious private club that offers a hallucinogenic drug and the companionship of high-class courtesans to its wealthy members. Ursula uncovers a locked room in Lady Fulbrooke’s conservatory in which the melodramatic poet is growing the plant from which the drug is made. Together Ursula and Slater uncover a web of drug trafficking, blackmail, and murder that stretches from London to New York. Can they find the evidence they need before one of them becomes the next victim? Their courage to complete their quest is unquestioned, but is their courage strong enough to open their lives and their hearts to one another and to move beyond shared passion to commitment and love? Garden of Lies is vintage Amanda Quick, a winning combination of breath-catching mystery and sigh-worthy romance with an independent, active, intelligent heroine and a hero who is a bit of a misfit with definite quirks. He matches her intelligence and is confident enough of his masculinity to support her independence, with occasional lapses due to his need to protect where he loves. This one is set in Victorian London at a time when advances in the typewriter were opening the world of work to women at an increasing rate. Quick uses this setting in interesting ways. The early Amanda Quick novels such as Ravished, Mistress, and Dangerous remain some of my all-time favorite historical romances, and although I don’t rate this one quite on par with those classics, I did find it a solid read. Quick (aka Jayne Ann Krentz) can be depended on to give readers smart, unconventional characters, a real sense of period setting, and a balance of mystery and romance in which neither genre overpowers the other. For me, that is a winning combination. If you are a fan of Amanda Quick, I expect you will find Garden of Lies a thoroughly enjoyable read. 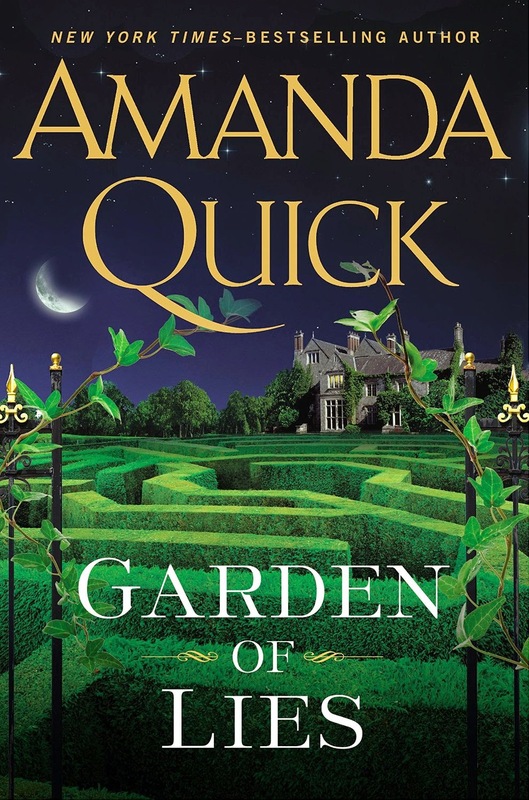 If it has been a while since you read Quick or if you like historical romantic suspense but have never read Amanda Quick, I recommend you give this book a try. I think you will be glad you did. I've always enjoyed her books and this sounds like another good one - thanks! I'm a fan too, catslady. Looking forward to this one! Amanda Quick books are an automatic read for me. I enjoy all of them very much. Me too, knye! In fact, I enjoy Jayne Ann Krentz in all of her writing personae. Can not wait for this one!! Love, love her books. I love her books. I still have several in my TBR Mountain to catch up on.